It’s a head-to-head matchup; a showdown between two of the great vehicles in the full-size SUV market. The 2017 Ford Expedition vs. 2017 Cadillac Escalade pits two very capable family vehicles against each other, battling for the advantage in sales and bragging rights. · The Cadillac Escalade has been in production since 1999, and is in its fourth generation. It received a significant facelift just two model years ago in 2015 after an eight model-year run from the previous incarnation. · The Ford Expedition has been around since 1996, and is in its final year of the third generation. The 2018 model year will be a complete redesign following 12 years of the current design. The 2017 Cadillac Escalade may initially seem like the fresher of the two based on this history, but the 2017 Ford Expedition holds its ground. Throughout its current 12-year run, the Ford Expedition has constantly evolved to stay at the top of the segment. In this niche market, it takes constant innovation to stay at the forefront. For 2017, the Cadillac Escalade has received a few tweaks, even though it’s just been around for just two years. The 2017 model year’s trim levels have been realigned to be more straightforward. They’re now called the Standard, Luxury, Premium Luxury, and Platinum trims. The Cadillac CUE infotainment system has been updated to include Teen Driver and Collection features, and the rear-view mirror now includes a live-view rear monitor. The front grille is slightly updated, and a new Radiant package has been added. For 2017, the Ford Expedition remains largely unchanged. Already equipped with the hugely successful SYNC 3 infotainment system and a trim lineup that spans well-equipped to luxury, why change a good thing? Both the 2017 Ford Expedition and 2017 Cadillac Escalade offer their premium SUV in two different sizes. For the Expedition, an extended-length Expedition EL adds 12 inches to the wheelbase and 14.8 inches in overall length. The Escalade offers the Escalade ESV, adding just over 20 inches to the overall length, stretching it to a bulky 224.3 inches long. That pushes its turning radius to 43 feet! On the other side, the Expedition has best-in-class turning radius for optimum maneuverability when towing a trailer. The extra length for the Escalade unfortunately doesn’t equate to more space inside. 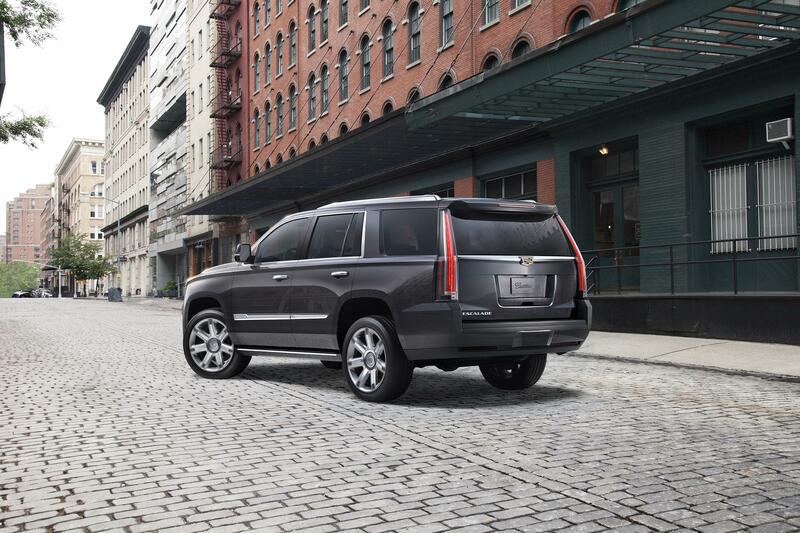 In the standard-size comparison, the Cadillac Escalade has max cargo volume of 94.2 cu. ft. where the Ford Expedition has 108.3 cu. ft. That’s a huge difference. Even with the stretched ESV trim compared to the Expedition EL, the Ford has 130.8 cu. ft. of max cargo volume, nearly 10 cubic feet more than the Escalade ESV. That’s two suitcases! · The Cadillac uses a 6.2-liter V8 producing 420 horsepower and 460 lb-ft of torque. That’s plenty of power by anyone’s standards, and boosts the Escalade’s towing capacity to a maximum 8,200lb. 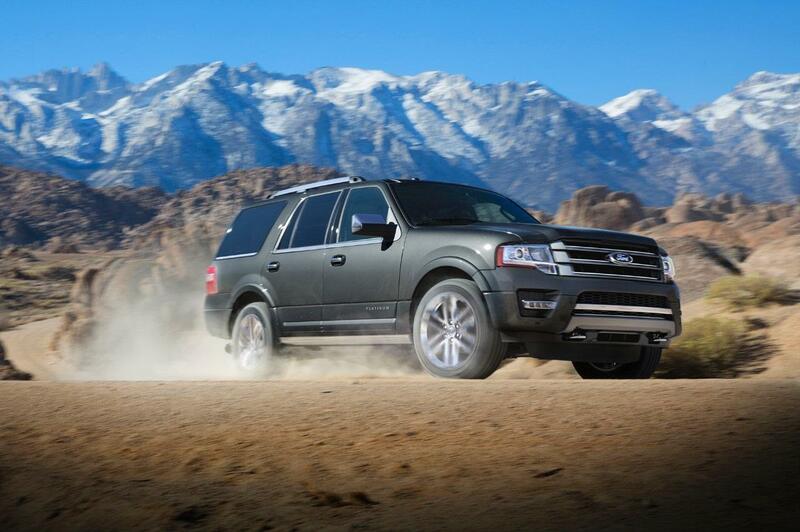 · The Ford Expedition is equipped with a small engine in comparison – a 3.5-liter EcoBoost V6 with twin turbochargers. The power production is quite respectable at 365 horsepower and 420 lb-ft of torque. Max towing capacity is 9,200lb for the Expedition. Despite the difference in horsepower, neither vehicle feels over or underpowered. And because virtually no one will test the limits of either vehicle’s towing capabilities, even with the Expedition on top, the better powertrain of the two comes down to fuel economy. The 2017 Ford Expedition has the edge in powertrains. Whether you choose the 2017 Cadillac Escalade or 2017 Ford Expedition, you’ll be privy to some of the best safety technologies available on cars today. · Automatic Parking Assist is an available feature. · Surround Vision System (360-degree camera view) is standard on all Escalade trims. · The Luxury trim has a Driver Awareness Package available, including Lane Keep Assist, Lane Departure Warning, and Front Collision Alert, along with the Safety Alert Seat. · Available on Premium Luxury and Platinum models, a Driver Assist Package includes the Driver Awareness Package plus the following: Adaptive Cruise Control, Automatic Braking, and Automatic Safety Belt Tightening. · Forward and Reverse Sensing systems are available. · AdvanceTrac with Roll Stability Control is standard equipment. · Blind Spot information System wit Cross Traffic Alert is available. · Rear-view Camera is standard equipment. · SYNC3 keeps your hands free, integrating your smartphone seamlessly with your Ford. · Rear-Continuously controlled damping suspension is standard on all Platinum models. The 2017 Ford Expedition and 2017 Cadillac Escalade are both packed with incredible features. However, getting into the driver’s seat means a big disparity on the bottom dollar. The 2017 Ford Expedition starts at $47,125 compared to the entry pricing of the Escalade at $76,395. At nearly $30,000 more for the 2017 Cadillac Escalade, the 2017 Ford Expedition is clearly a better buy. Find the 2017 Ford Expedition at your local SoCal Ford Dealer. Whether you want the well-equipped 2017 Ford Expedition XLT or the ultimate package, the Ford Expedition Platinum, you’ll find it right here.